We have over ten years experience in writing and hosting murder mysteries. Our party planning and event management services are trusted by hundreds of private and corporate clients. We pride ourselves on the quality of our customer service, and are committed to surpassing expectations from enquiry to event delivery. Our murder mysteries don’t use actors. YOU, your family, friends or colleagues will all receive a role to play in the terrible tale. Our trained facilitators will be there to host your event, leading you through all activities and games. We only use high quality and reliable event venues and third parties, which we can source for you as part of the service. You can enjoy your murder mystery over dinner, wine tasting, during a team building day, or purely as a fun activity. Our fun and engaging activities are ideal for corporate events, hen parties, birthdays, team building activities, and more. We are happy and able to cater for groups of 10 to 100+ guests. Our murder mysteries last between 2 – 3 hours. Since we don’t use actors in our murder mysteries, it’s you that gets to play the exciting, scandalous characters. These include suspects, witnesses, detectives and more. You’ll receive all your character information in advance with fancy dress suggestions so you have plenty of time to get into character. Murder mysteries are perfect for getting the party started at birthday celebrations and hen parties. Each activity is tailored to get your guests having fun together, so your party are still laughing long after the murderer has been exposed. Looking for a murder mystery dinner party? We work with fantastic restaurants which we will book on your behalf to make the party planning process as easy as possible. How does a private wine tasting murder mystery sound? Speak to us about our party packages that include wine tasting with your murder mystery. You can combine this with dinner too. Head over to our contact page to get the party started. For an unforgettable night out, buy tickets to one of our public murder mystery events in Manchester running regularly throughout the year. Want to hold a public event of your own? Get in touch below. We offer refreshing team building activities that won’t have your staff running for the hills! Each activity develops teamwork and analytical skill through communication, investigation and a good dose of fun. Want something a little less formal for an evening event? Our private parties provide engaging and humorous entertainment that won’t fail to delight staff and clients. "Thank you for making our Christmas Party so enjoyable. I would recommend a Manchester Murder Mystery to anyone looking for a great night out!" 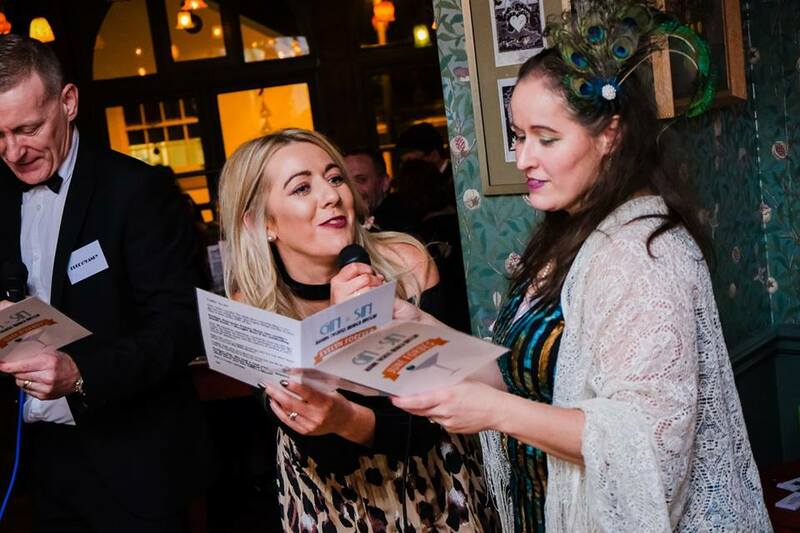 "The Manchester Murder Mystery team truly delivered a night to remember. Not only did they provide 2.5 hours of entertainment, they created a wonderful, inclusive atmosphere that got everyone involved, relaxed and chatting. These ladies really know how to put on a show and left everyone feeling like they’d had a brilliant night out." Our murder mysteries are built on fun and flexibility. This means you can have your event anywhere; a bar, a restaurant, hotel, even your own front room. Groups of 10 to 100+ can join in and we offer assistance in finding a suitable venue. Head over to our contact page to book your murder mystery. Want to join one of our exciting public murder mysteries? See what events are coming up and buy tickets here.